Oh!MyGoh: Install multiple versions of IE on one OS. Install multiple versions of IE on one OS. Want to test your website in various versions of Internet Explorer(IE)? 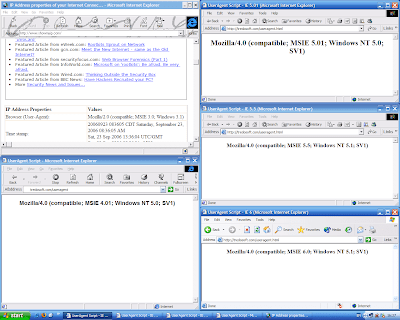 1) Download the application : http://tredosoft.com/files/multi-ie/multiple-ie-setup.exe called "Multiple IE". 2) Install another virtual OS using Virtual PC or VMware, then install the IE version you want. - the problem is, time consuming & extra harddisk space needed. Not everyone know how to install and configure virtual OS ( but it is not too hard, i will teach how to install a virtual OS with just few steps) and you might install many virtual OS if you want to install more versions of IE. - the good thing is, it wont corrupt your current IE. So you can do what ever you want in this virtual OS. 3) Install different OS in your different partitions of your harddisk. 4) Mix. (1)+(2) : Install ONE Virtual OS, then install ONE Multiple IE installer in the Virtual OS. - the good thing is, if anything happen wrong to the Multiple IE, you can just delete the virtual OS . - And it just need a bit extra memory & extra harddisk, it depends on your OS version. Of cause the more memory you have the smoother your OS running on your PC. There is another better solution: install a software called "IETester"
There are some limitations, but it is good enough for those who not really 100% care about the version problem, BUT need to make sure there is not look too worst in the older versions of IE.